Emirates utilised the BBC Worldwide mobile site to launch their advertising campaign. High stand-out on the screen benefited the brand. As well as the weighting of the advertising content, the prestige of the BBC environment and the associated BBC brand halo effect. Emirates are also reaping the benefits of being seen as early adopters of the mobile channel. 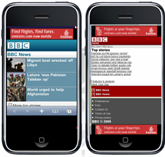 Emirates was one the BBC's global launch partners advertising on BBC Mobile first started. This campaign not only hugely raised Emirates' awareness, but also drove a high volume of usage to Emirates' own mobile site. Key performance indicators included the uplift in mobile check-in use and the awareness of mobile check-in services.